• Migrant worker during the Great Depression. • Had to take care of Lennie Small, with the mental abilities of a child. • Has a dream of his own ranch, with Lennie. • Warns Lennie that he must not cause trouble, or he will not be allowed to tend rabbits. • Lennie has a fight with the son of the boss, Curley, former semi-pro boxer. • Curley’s wife tries to speak to other people than Curley himself, and eventually lands up with Lennie. • Lennie accidentally kills Curley’s wife, and George and Lennie need to flee once more. • George needs to kill Lennie, fast and painless. He thought this was better for Lennie than to be killed by the angry mob, led by Curley. 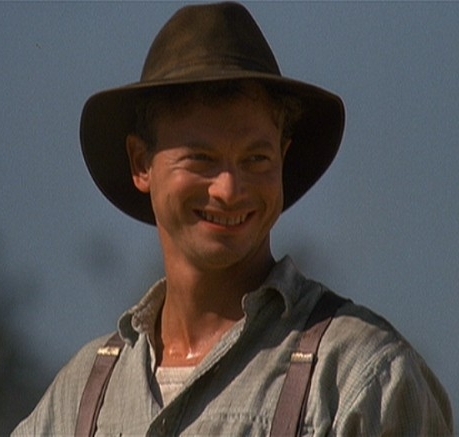 George (played by Gary Sinise) from "Of Mice and Men"
Don't get yourself into trouble, Lennie! George is tragic hero in a strange way: the heroic deed he does in his life is that he kills his best friend. So why does killing your best friend make you a tragic hero? This is because it is in the end for Lennie’s own good: George prevents him from getting into even more trouble. The murder also shows that George realizes his great flaw: leaving Lennie live without psychiatric help. Lennie is just too big a threat for society to live “in the wild”. He also kills his own dream: starting a farm. Without Lennie it will not be possible to earn enough money for his dreams to come true. 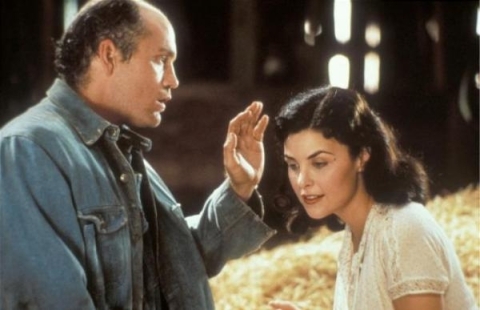 But if he would have spent his life without Lennie all the time, it would be possible for him to buy this farm, because he wouldn’t be fired at a regular basis like with Lennie. So his big flaw in life is living with Lennie, which has made his life a struggle, and prevents him from achieving what he wants. This makes George a tragic hero.